Wow. Bun nicely greased too! I think my colons may actually drop out of my body. Pretty good burger underneath it all – 1/2 lb flattened, irregular patty – maybe a spatula mash on a griddle? Fresh fixins – tomato, lettuce, pickle, onion. Toasted buns. Fresh diced jalapenos available at the salsa bar. 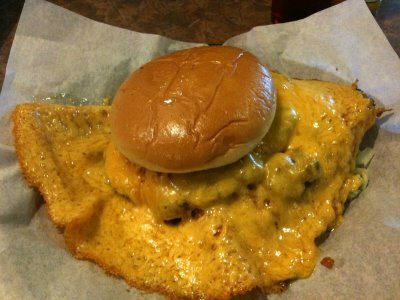 It’s really something you have to try – words are inadequate to describe how much f*cking cheese is on this thing. Burger was a good 7 inches across, with 1/2 lb patty, piles of veggies, and, as you can see, half of a cow’s daily output of cheese. Definitely not a fast food burger. Looks like a new venture is slated for the failed Bear Rock Cafe on Parmer. “J & J B-B-Q”. Judging from the ample signage, breakfast will be their specialty, followed by BBQ and then burgers. Burgers are specifically called out, which is encouraging, however it looks like the burgers will play second fiddle to other offerings. Whatever it is, it can only be an improvement over the mediocre Bear Rock Cafe.